It will probably come as no surprise, but it was discovered at a recent Far Cry 5 preview that the game will feature microtransactions. Though we weren’t able to capture the shop menus during our play session, there was a large option that prompted players to buy “Silver Bars.” Immediately obvious as available for purchase using this special currency were some of the outfits featured in the character customization menu, though PC Gamer was able to dig up a little bit more information from Ubisoft regarding Silver Bars and their use in the game. PC Gamer ran across the messaging pictured below when they picked up some Silver Bars while looting an outpost they had just taken. 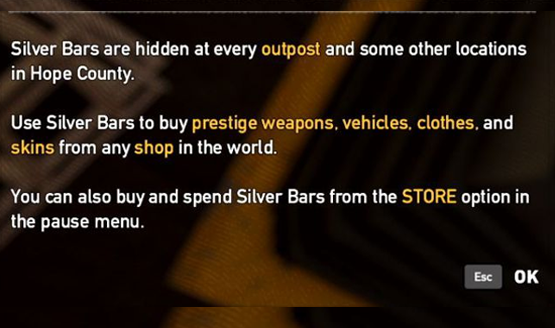 Apparently Silver Bars can be found out in the open world, at every outpost and in “some other locations in Hope County.” Silver Bars will allow players to purchase “prestige weapons, vehicles, clothes, and skins” from any shop in the game world. A Ubisoft representative confirmed that loot boxes will not be present in the game. Silver Bars will be used to purchase items directly, rather than rolling for a chance at something. While Silver Bars will be available to earn at outposts, there’s no telling what the conversion rate is. We’ll have to wait until the game release to find out how much of this resource can be found in the open world, if players can grind for it, and how much it costs to purchase (the PlayStation store was offline during our play session, so Silver Bar pricing was not available). In a time when post-release monetization is under scrutiny, Far Cry 5’s microtransaction options seem like a good compromise. It’s a time-saver for those who don’t want to grind, but offers no obvious benefit to those who are willing to pay. Last week gave us a ton of new Far Cry 5 info, including a number of gameplay videos from a preview event. You can check out some co-op gameplay undertaking a mission for Hurk Sr., father of Far Cry’s famous Hurk Drubman. If you loved Boomer the dog and want even more Far Cry 5 animals, we’ve got gameplay of rescuing and recruiting Cheeseburger, Far Cry 5’s lovable bear ally that will give Boomer a run for his money. We also got a look at some of the Far Cry 5 character clothing customization options, something new to the Far Cry series. Finally, psychedelic drug trip missions make a return in Far Cry 5, and we’ve got a brief video looking at one. What do you think of Far Cry 5 microtransactions? Are they fair or do you wish that Ubisoft wouldn’t have included them at all? Let us know your thoughts in the comments below.